I suppose the first experience most people have of the benefits of grouping together is when taking on Hogger. The first thing I noticed is that people using the 10-day trial account are at a significant disadvantage here - they can't invite anybody to join their group. Instead they have to rely on somebody else to invite them. I joined such a pick-up group recently. We were a warrior, a priest and me. I was the highest level character, at level nine. 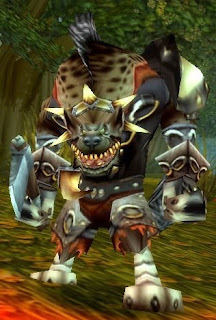 The people were nice, but once it came to fighting Hogger, I made a huge mistake: as a mage, I'm only wearing cloth, and when (after one particularly fiery strike from my fireball spell) Hogger decided he was going to ignore the warrior in our group and swing his axe at me, well, I panicked. What I should have done was coolly cast a Frost Nova spell at point blank range as he swung at me, then stepped back and let the warrior take his attention, and let the priest heal me. What I actually did was - I ran! I ran blindly away from Hogger. Hogger ran after me, and the warrior ran after Hogger. The priest couldn't target me to heal me, because I was moving so fast and both Hogger and the warrior were interfering with his target selection. You know what happened next. I got too close to a nearby gnoll camp and four stout gnoll warriors came out and gave Hogger a hand! They made mincemeat of the warrior and me, then Hogger returned to give the poor priest his full attention. We were wiped out. However we learned from our mistakes. I learned the value of standing my ground and being prepared to die if it meant the group would succeed. I also learnt the value of making sure Frost Nova was available on my action bar. And the group leader learned the value of kicking a poor player out of his group! What a pleasure it was, then, to meet a friendly Paladin who seemed to know what he was doing, and who invited me and three others to join him. We hung around, killing gnolls, until Hogger made his re-appearance, and were able to make fairly short work of him (because we'd been diligently killing gnolls beforehand, there were none around to intrude on our battle). The pick-up group is one of the things that makes online gaming so interesting. You meet with some strangers, you work together on a task for a short time, you have some fun, some banter, then you go your separate ways. After a while you notice that you see the same characters again and again, because - guess what - they're levelling their characters at about the same rate as you are, and are often on the same quests. You avoid the people you don't get on with, you team up again with the people who are on your wavelength. Pretty soon you're becoming friends. The first thing I did on leaving Northshire was to head down to Goldshire, and got Innkeeper Farley to set my hearthstone to the Lion's Pride Inn. What a fun place Goldshire is! Loads of exotica - my first sighting of elves and draenei and high-level characters mounted on all sorts of beasts - and my first duel. Of course I was rubbish and got killed immediately. Didn't know what I was doing. Anyway playing about dueling is a fun way to practice Player vs. Player fighting (PvP), and eventually I managed to win a duel and gain the "Duel-icious" achievement. Goldshire is a great place to be based in, since so many of the Elwynn forest quests either involve you starting or ending there, or returning there to empty your bags (by selling the contents to Tharynn Bouden). I love the stories behind the quest chains!